Finding out how to get an HGH prescription does not have to be a complicated process. Growth hormone deficiency in adults is diagnosable with a simple blood test. After checking the findings of the lab panels, a doctor will be able to ascertain if GH levels are below the point needed for proper bodily functions to occur. Can you tell me how to get prescribed growth hormones? What steps do I have to take? There are four main components to getting a valid prescription from a doctor for HGH injections. Each of these steps must be completed before a diagnosis of growth hormone deficiency can be made. Can you tell me how to get an HGH prescription online? No matter how you want to go about getting real HGH legally, you will still have to complete the four steps mentioned above. No legitimate and honest doctor will risk his or her license by prescribing HGH without completing the proper protocol. If you decide to use a national clinic that you have found online, like Greenberg Health, you will simplify the process by completing step 1 over the phone and step 4 online. You can see any local doctor for your exam, and we will arrange for your blood test at a convenient lab. All results come straight to our clinic. Can my general practitioner provide me with a prescription for HGH injections? Although logistically any physician can write out a script for this medication, asking how to get prescribed HGH from your doctor is akin to wanting him or her to perform brain surgery. It is not in your best interest, or that of the practitioner, to offer treatment that is not in their field of expertise. The balancing of hormone levels takes advanced knowledge in that area so as not to further create an imbalance that can affect other hormonal secretions and physiological functions. That is why an HRT specialist is the best option. Can you tell me how to get HGH prescribed by a doctor I have never met at a national clinic? 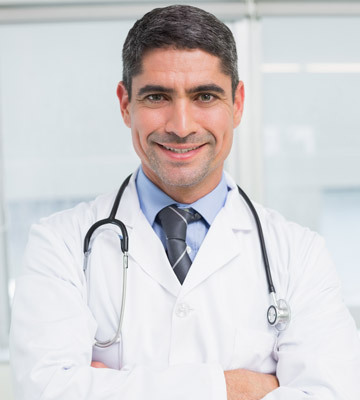 Although you are not meeting in person with the hormone specialist here at Greenberg Health, you are still undergoing a thorough physical examination with a doctor of your choosing. This report of findings will be sent directly to our clinic for the HRT specialist’s review, along with the results from your blood test. After going over all of this information, along with what you provided on the medical history questionnaire, and the information gathered during the consultation with one of our clinical advisors, the doctor will be able to provide you with a customized treatment plan. We now turn our attention to why a doctor will prescribe HGH for adults. Growth hormone deficiency is a very real condition that can lead to osteoporosis, dementia, obesity, and other serious health concerns if not caught and treated. For our last question about how to get an HGH prescription, US residents will learn why they need human growth hormone therapy. Why do doctors prescribe HGH to adults? These are just some of the symptoms an adult with growth hormone decline might have. Now that you know how to get HGH prescribed to you, and why you might need it, the time has come to take action. Contact Greenberg Health for a complimentary, confidential consultation to learn more about what HGH will do for you.